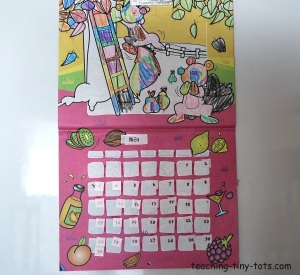 Toddler Activities: Making a calendar is a great individual or class project. It's a perfect way to introduce simple Math concepts. A great beginning of year activity which introduces numbers, days of weeks, months, concept of time and even seasons in a fun interactive and meaningful way. Buy a calendar from a craft stores such as the Dollar Stores Office Supply Stores, WalMart, or Target. Amazon has some below as well. Markers, crayons or other writing materials. If you have a blank "create your own calendar" you are ready to start. If your calendar has a picture, simply adhere a piece of cardstock or construction paper cut to the size of the calendar over the picture and glue using a glue stick for smoothest results. Have your child decorate the page. 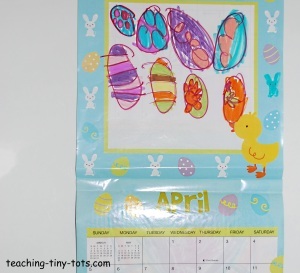 For younger children, have them decorate one page a day or just before the month starts. Go over the name of the month, days of the week and count the days together. Write out colorful stickers for child to adhere on special days like birthdays, school, grandparents visiting, zoo. Have your child cross off days finished or put a small sticker on it instead so as not to block the numbers. You can just write on the calendar for daily events, but my children began to recognize the words school, art, birthday, etc. by placing the labels on themselves. I printed extra of each and they would find the word they needed by identifying the beginning letter, and then by recognizing the word. Hang in a easy to see, but out of reach location. Refer to the calendar regularly and you will be pleasantly surprised how fast they start to pick up the concepts. If you use a regular calendar you can glue your own pictures on top of it for your child. Print your own calendar from many free online sources. Having a sample available especially when making it in a classroom, makes it easier for children to visualize the end product. For older toddlers, you can find sticker calendars that they can stick on their own numbers. I wrote the numbers on the square and they matched it with the sticker. There are usually fun stickers to mark special days as well. This is a great any time of year toddler activity...focus on the month coming up and print out a monthly calendar from the many free sources online. Great toddler activity for small groups of children. -Print out some cute coloring pictures online or cut out pages selected from a color book. -Use stickers, flat collage items to decorate the page. -The idea is for the child to feel he/she made her calendar which makes it something your child will be more interested in. Post pictures throughout the month of child doing special toddler activities. This actually makes a very nice collection of pictures of the year. For the grandparents I actually made calendars using a online photo service with pictures collected from the year before. It makes a really nice gift! We have this Magnetic Calendar Puzzle by Melissa & Doug which the girls enjoy. I would recommend it for older toddlers due to the size of the magnetic pieces. I would also recommend that it is hung out of reach of children and only used with adult supervision. The educational benefits are numerous and the learning comes naturally if you refer to the calendar regularly. Your toddler will gradually assign meaning to the calendar concepts. -Months of the year: Talk about what letter it starts with, sound it out, read through the calendar forwards/backwards. -Days of the week: Reinforce days by saying,"What is tomorrow, what day was yesterday?" -Point out special days such as birthdays, holidays, or special events. Make or buy little calendar stickers to identify these special days. -Numbers 1-31: Have your child find a particular number, count together forward or backward and point to the numbers as you count.